as a Religious Science Certified Practitioner, R.S.c.P., where she offered healing prayer treatment to the congregations and served as vice president on the board of directors at Golden Gate Center for Spiritual Living in California. and guidance from their personal Akashic Records along with numerous healing tools, meditation, and prayer systems. The school has thousands of students worldwide with dozens of certified consultants and teachers. When Lisa Barnett wrote The Infinite Wisdom of the Akashic Records, she knew that she had an instant success on her hands. Rocketing to bestseller, it helped people to understand that there is a universal archive of our infinite soul’s journey through the millennia and the dimensions. Furthermore, it can be accessed to understand and help course-correct in this lifetime. Barnett, the internationally renowned founder of the Akashic Knowing School of Wisdom, has been teaching people how to connect with the Akashic Masters for many years. But she also spent 10 years as a prayer practitioner at the Golden Gate Center for Spiritual Living in the San Francisco Bay Area,guiding people to the right prayers to seek intervention for specific issues in their lives. So, was it any surprise when the Akashic Beings of Light metaphorically tapped Barnett on the shoulder and asked her to bring forth a series of powerful, Source-imbued prayers that help people turn their lives around? Indeed they did! 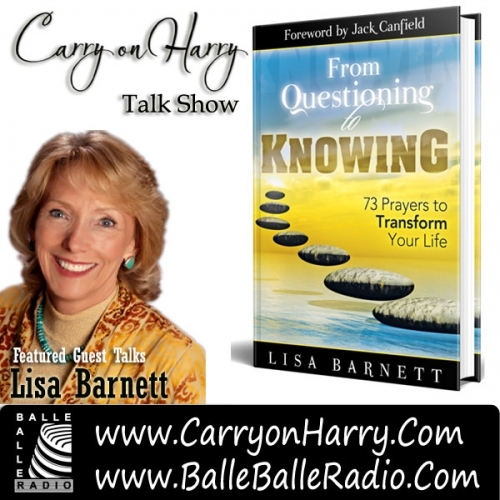 And that’s how From Questioning to Knowing: 73 Prayers to Transform Your Life was born. From Questioning to Knowing, provides the answers to the questions that--until now--have not been answerable—why you are stuck where you are and how to move forward, grow, expand and be happy.